Metabothin B56 from American Generic Laboratories. Metabothin, or Metabo Thin, by American Generic Laboratories (AGL), is the Ephedra Diet Pill that will make your dream of a perfect body into a reality. With a proprietary blend of the strongest, all natural weight loss herbs, Ephedra products and supplements available, Metabothin Ephedra Diet Pills really delivers excellent results. Metabothin is an all natural weight loss blend created for exceptional diet & energy. It has been demonstrated to achieve real weight loss with its special formula containing high quality, natural herbs from around the world. Most importantly, Metabothin contains 10 mg of Ephedra extract and 40mg of Caffeine (from Guarana). Goldenseal, Ginger Root, Green Tea Extract and Royal Jelly may be among the reasons why Metabothin is so energizing. But this potent energy producing formula is also a fat burner. Metabothin is designed to help your body produce more heat which in turn burns more calories (from fat) while maintaining lean body mass. Add appetite suppressing ingredients combined with essential minerals and Vitamin E and you have Metabothin, quite possibly the best selling weight loss formulation of all time. 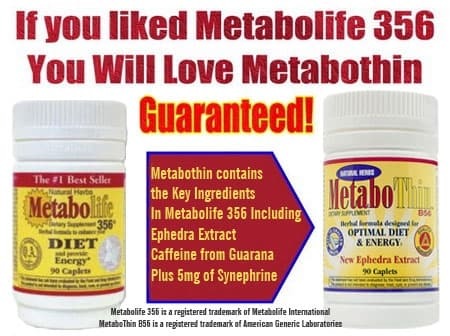 Metabothin replaces Metabolife 356 ephedra, adding Synephrine for an even more complete solution. This means is that if you liked Metabolife Ephedra, you'll love the new Metabothin ephedra diet pill. The proprietary combination of centuries old herbs with the most technologically advanced new supplements means that you are buying the most effective weight loss ephedra product possible. Ginseng, cocoa extract, royal jelly, ginger root, and bitter orange (synephrine) have long been praised for their weight loss and energy boosting properties. Add the indisputable, widely tested metabolic powers of pure ephedra extract, and you have the most powerful over-the-counter weight loss solution available. You don't have money to waste on a fad diet pill. Metabothin uses proven methods to shed extra pounds quickly and easily. Metabothin will help suppress your appetite, making dieting painless instead of a constant struggle. But how many times have you cheated on your diet not from hunger, but because you felt so tired and groggy that you couldn't get your day-to-day tasks done? You can't spend months feeling like a zombie. Too many people count on you. 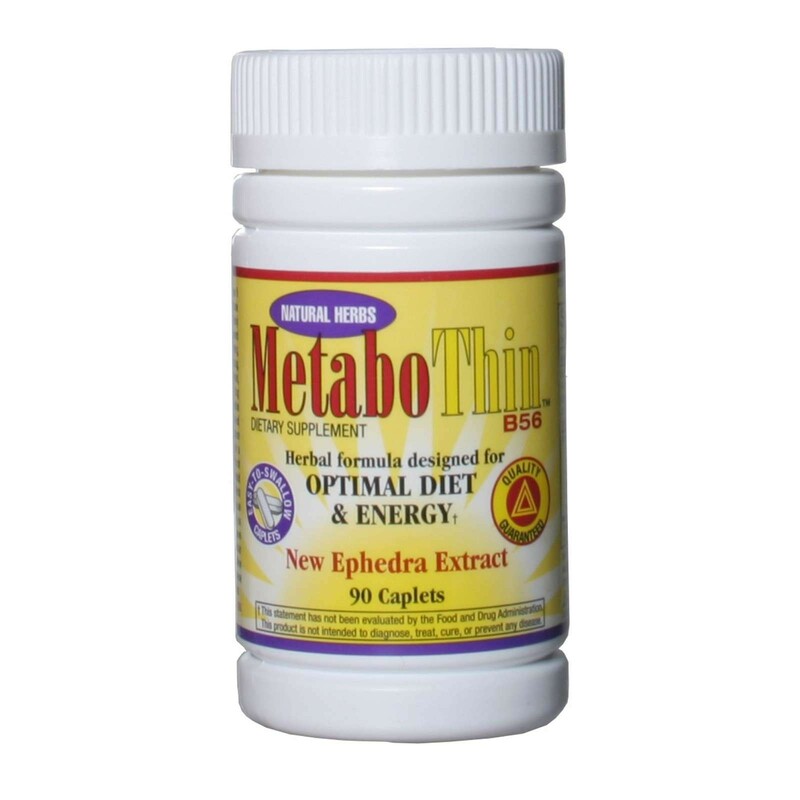 The Metabothin ephedra supplement will help you reach your weight loss goals quickly, while keeping your energy levels high. You'll feel better than ever, losing weight while remaining effective at home and in the workplace. One-time Stacker 2 ephedra users are realizing just how powerful the Metabothin ephedra diet pill is. Through thermogenic properties, it will burn calories all day as if you were exercising. Your body will act as a metabolic furnace while you go about your normal routine, saving you time and energy, and turning your weight loss dreams into reality. If you liked Metabolife 356 you’ll love Metabothin. Metabothin contains key ingredients found in Metabolife 356 and new, synergistic ingredients that make it better. Metabothin is power charged with 10mg of Ephedra extract per serving. Unlike Ephedra Free products that promise much but deliver little, Metabothin is the real deal. Say goodbye to broken promises and failed attempts with inferior Ephedra replacements and say hello to Metabothin. Metabothin Directions: As a dietary supplement, take 1 caplet 3 times per day with food and water.